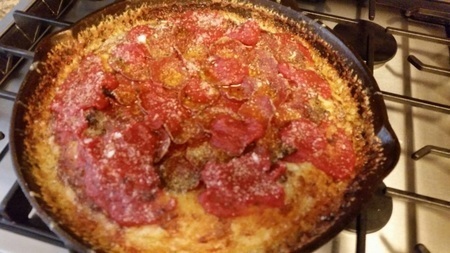 I was reading about Pequod's Pizza in Chicago the other day so I thought I would experiment with a cast iron pan. I didn't quite follow the recipe from The Pizza Bible though. For dough I used the master dough with starter. 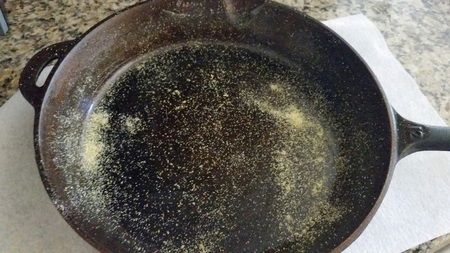 I greased the pan with lard then sprinkled that with cornmeal followed by 2 Tbsp of olive oil. I then pushed a 22 ounce dough ball out on a corn meal dusted surface to fit the bottom of the pan. I baked that for 8 minutes at 500 on a 1/4" steel plate. I took it out, added whole milk mozzarella, Cabot white cheddar and homemade sweet and hot sausage (raw) then baked that for 10 minutes. I took that back out, added sauce and pepperoni then baked for another 8-10 minutes or so. Then I took it out, added some more warm sauce then dusted with pecorino and oregano. The bad: the dough ball was too big for the 12" pan I think. It was too thick in my opinion and a little gummy in spots. If I do it again I will use less dough or the same amount but in a 14" pan. I should have used part skim mozzarella too I think; the whole milk stuff was a little too runny for this. I should have just done the sausage or the pepperoni, not both. I violated my own "less is more" rule. The good: The fried cornmeal coated crust was really, really good other than a few gummy spots on the interior. It tasted like something that should be sold on a stick at a fair. Not high-end, just good. The sweet and hot sausages, recipe from the book, were outstanding. The caramelized cheese at the edges was nice. It was a very filling pizza. This would make a good cold, foggy or wet day pizza with a good beer. 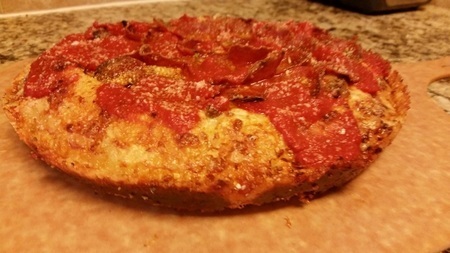 It wasn't perfect and it didn't look like the pictures from Pequod's but it wasn't too bad either. Chuck I've been experimenting with Cast Iron pizzas lately. I'm still trying to find the optimal amount of dough for a 12" pan. A 22-ounce ball is about 625 grams. I did a test with a similar amount of dough and found it was too much. I also did one with 450 grams (16 ounces) . That was too little. My next test will be 525 grams (~18.5 ounces). I'm pretty sure this will be the sweet spot for the type of cast iron I'm going for. For one of my recent experiments, I used Polly-O mozz. It's a whole milk mozzarella. Unfortunately it was too soft and oily. The pie didn't hold up. It tasted ok though. 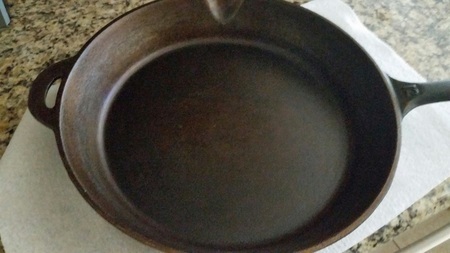 I'll post pics of my next cast iron test. Did you let the dough rise before the par bake? I've had good luck with cast iron pizzas. My skillet is a little large (it measures about 13 1/4) and I use a 625 gram deep dish dough. I've used a part-skim mozzarella and I've used a Polly-O whole milk mozzarella, the the crust held up to both. 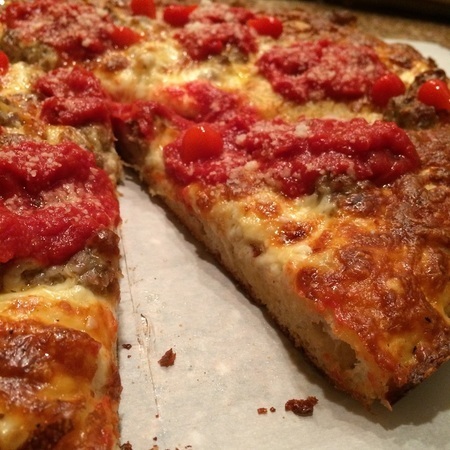 It's a great pizza and the corn meal in the dough combined with the corn meal coating is a winner. I hadn't considered using the master dough, and might try that, although I might try a different lower protein flour if I went in that direction. Yep, let it rise over an hour. If anything it may have been a little too thick. There were just a few gummy spots. If it weren't for those it was very good. I think if I baked it any longer the bottom would have burned. The nature of the heat conduction is totally different with the cast iron, for the beginning of the bake, the iron is absorbing the oven and steel heat, so it takes longer for the heat transfer to hit the dough from the bottom and sides. I didn't realize that's what was going on with the heat Adam. I did notice that cast iron pies were very forgiving. You can bake thicker doughs for close to 30 minutes without it burning. They definitely heat differently than a thin steel pan. I am considering trying it with a vintage pan rather than the cheap, modern one I used. The vintage ones just seem to be thinner and heat more evenly on a stove in my experience so I imagine that the oven would be no different. The bottom of my pizza was just about perfect, I was really concerned that any more time would burn it but maybe I will give a longer par-bake a try. 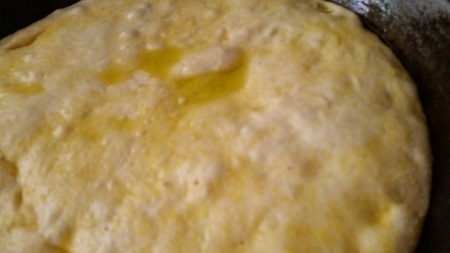 I am still going to try reducing the dough though depending on what pan I use. This was just a bit too thick I thought. Chuck-- one thing Adam mentioned in a previous reply was letting the dough rise before parbaking. I've found this to be really helpful. You can get some nice thickness without getting an overly doughy pizza.